There has been quite a bit going on lately which has resulted in a lack of posts here on the site. I’m still here…just working on some “new” things. The biggest news for me personally is that I am in the process of moving to a new home. I don’t have to tell many of you how big of a job that can be. This weekend will be filled with packing and sorting. I’m moving to a house that has almost twice the square footage of our current home, so this will be a BIG move for my family. With the move, I will finally have the Home Office I have dreamed of for quite some time! Another “change” of sorts started late last week when my Dell M90 laptop ceased to function due to a failed video card. It has been a good laptop overall in the 2+ years that I have had it. The unusual thing about this hardware failure is that due to a shortage of replacement cards, Dell is replacing the ENTIRE system. Not having my laptop which is my primary machine has no doubt thrown quite a kink into my work schedule and resulted in a few missed deadlines. Thanks to our IT department, I have been able to keep working by getting a workstation on loan from another department. If you read the SolidWorks Forums, there have been a few users who have had some issues with M6400 laptops. 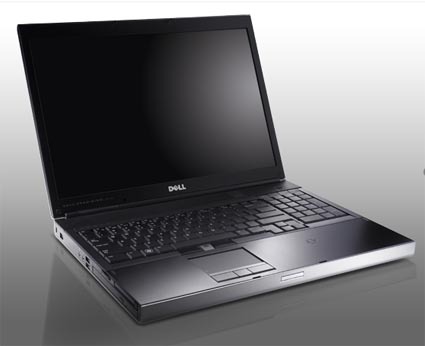 Most of these laptops have had the Quadro M3700 video card which has a whopping 1 GB of on-board memory. The common failures so far have been centered around overheating of the video card which has resulted in failed boards & motherboards. My M6400, since it is an “equivalent” replacement, will have the Quadro M2700 video card which contains 512 Mb of on-board memory. I must admit that I feel a little more at ease with this card at this point. Time will tell. One of the things I’m looking forward to the most with the M6400 is that the keyboard has dedicated number pad! I’m also working on a new page for the site which hopefully will be ready next week. It will offer some content that I think SolidWorks users (both new and old) will REALLY enjoy. I can safely say that I haven’t seen any other site on the web that has offered this content. That’s all for now… I’ve got some packing to do. Stay tuned…MORE to come! Hi Ricky. This is Richie. (BlogS) Sorry to hear about your laptop demise. But I am very glad to hear about the move you and the family are making into a much larger home. Extra room is always nice to have but you have to keep it under control too. Good luck on the move. Take care. Good luck with your move Ricky, and again congratulations on the new house. You will really enjoy that home office! Good luck on your move. That's ranked close to my “going to the dentist” category on favorite things to do. Hopefully you will have some good weather to work with. Whenever you get beyond this, I would like to pick your brain for a few minutes regarding blogging related to Protomet. Nothing urgent. Oh moving to a different house is really a backbreaking task! Lots of stuff to take care of, packing, organizing, sorting through all your things and then bringing them out again in your new home. Hope all goes well with the move. I'm glad you'll be getting the home office you've always wanted. Will look forward to your laptop review. Thanks! Thanks Buddy! It was GREAT to catch up with you the other night. I'll be talking to ya again soon! Hope the move went ok. Just wondering if you've got the new M6400 yet – and if you have what do you think? My laptop is dying (video card) and am considering the M6400. My current machine is a Toshiba, and although it's slow these days, I've used it every day for 4 years. I really appreciate how dependable it's been. My previous machine on the other hand was a nightmare – don't even want to talk about it! Therefore I'm willing to spend more to get performance and reliability, I'm just worried the M6400 is all performance and no reliability. The other option is to go for a cheaper M90 (you can pick them up for about £900 now). So I'd be really interested in hearing what your first impressions of the M6400 are compared to your M90… if you get time amongst all the unpacking and catching up with deadlines! i need so tips on laptops im getting one and what should i do when i first get it???? like in downloading stuff do i need to update it?? Great information. Really thanks a lot. I want to buy a new laptop and I am sure it will help me a lot. Thanks for sharing. Will be waiting for the new ones. I am buying a laptop today, and I want a laptop that is fast, can run multiple programs, can play DVDs, and have lots of room to store music and pictures. Preferably if it is also under 1,000 dollars. I'm happy for you that you now have the home office of your wish. Moving to a new home may be a daunting task, but the benevolent changes that it brings are definitely worth it! Just want to tell you that i have the Dell M6400 workstation with the Quadro M2700 video card and it works like a charm! I primarily use it for SW, and it is very very stable, and handles all task's (as far as i have experienced) perfect! I hope you will find it so good as I do. I have been using my Dell studio Laptop, life has become so easy with Laptop, I can take care of my kids while doing some work online. Good read, thanks for the post Ricky. So your working on a loan company. Your laptop is so cute. How much is it? Even I am really very curious to know that! At the time my M90 went down, Dell had no video cards in stock. I actually didn't ask them for a replacement…they offered one! Maybe it was just good timing…who knows. A friend of mine had to replace the video card in his M90 multiple times after the second or third one went out, he was issued an M6400 replacement system. Best of luck with getting your system back up and running. I know how frustrating it can be. From the time my machine went down to the time my replacement system arrived was almost two weeks…so I still lost quite a bit of work time while scrambling to get some work done on some older legacy systems we luckily had available for use. Good luck to your move.. And congrats to your new home office.. wish all the best..
Care to include in your new site the hows, what and where of caring laptops. I'm sure these topics will result to huge followers are seldom we can read help stuff for laptops. hey, i am using now laptop sony vaio vgn-fw11e with vista, and have to tell you that i have big problems with configuration of wireless. I had some time ago Dell but it was old model. There is always something new to do … only problem the is time. Congratulations for your new home. Take your time for home and family, have all the best! This review is a new one and it helps people to know about the video card of their laptops. Also I'm eagerly waiting for your new page in the site to understand about this in more deeper manner. Moving is a big job and you should have figured it out because there are moving services all over the country:)) They exist for a very good reason: moving is important and requires resources that you might not have. You will love the new laptop as I have had nothing but great success with mine. China companies and perhcasurs possess a distinctive technique and attitude towards the business enterprise. Trading with China, you may have to be a lot more courteous and gentle in your behavior so that you can impress them.